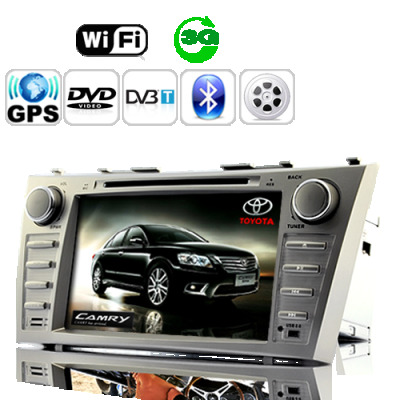 Successfully Added Road Emperor Toyota Camry Edition - In Dash Car DVD With 3G Internet (WIFI, 2DIN, GPS, DVB-T) to your Shopping Cart. If performance matters most and money is no object then we invite you to complete your Toyota Camry with The Road Emperor Car DVD Player (aka Toyota Camry Emperor), which has been especially designed for Toyota Camry (2007 and later). Truth be told, to call The Toyota Camry Emperor a mere car DVD player is gross understatement indeed. Akin to calling a samurai sword just a blade or a CheyTac M-200 Intervention just a gun. Closer then and let us take a peek under the hood of this impressive in-car system and: Prepare. To. Be. Amazed. Because you want what others cannot have: There's a very specific reason why the CVFY-C109 is called The Toyota Camry Emperor. It rules. What other car DVD player allows you access to the 3G internet? Simply insert your WCDMA 3G sim card into a 3G dongle, launch the web browser and you've got access to lightning fast internet in your car. Stream audio (live365.com, soma.fm, and sky.fm come to mind) or watch web video on The Toyota Camry Emperor's high definition 7 inch touchscreen. Alternatively if your vehicle is near a hotspot, access the Internet through The Toyota Camry Emperor's wifi dongle (included). Just imagine it...cruising the streets at dusk, the weather ideally idyllic, the time of day where imagination takes hold to whisper of the wonderful possibilities within reach, some downtempo lounge or some livelier vocal trance streaming through your speakers...and you've got strangely decadent places to go and decadently beautiful people to see. The BOB principle: Because it's not enough to simply exist we arrive at the BOB principle. To be the best of the best. Accordingly, at the heart of The Toyota Camry Emperor is a performance addicted Telechips tcc8900 CPU. Korean tech giant Telechips is a leading microprocessor maker for automotive multimedia units and the tcc8900 is their brilliant brainchild. The "89" houses a 500MHz ARM11 core and a separate ARM Mali 200MHz graphic processing unit. And like all great technologies, synergy dictates that the whole is far more than the sum of its parts. A dedicated GPU allows picture in picture graphics to soar and 1080p videos to scream such that 500MHz plus 200MHz definitely add up to more than 700MHz, which is especially useful when you're running top of the line GPS software or watching streaming high definition discreet entertainment in the privacy of your automobile. Architect of your own destiny: They say the type of car you drive speaks volumes about the type of person you are. To that end we'd like to suggest that the type of in-car system you install in that said same car could very well determine your destiny. Are you simply content with basic living or do you want it all? If you answered the former then jolly good. There's nothing wrong with lack of ambition. The world still does require waiters and doormen in droves. But. If you aspire for more from life, from yourself, from your car, then The Toyota Camry Emperor replete with 3G and WIFI internet, dual encoding DVB-T receiver, advanced GPS functionality, a truly superior media player, and so much more was designed especially for you. Accessing the internet on The Toyota Camry Emperor is a truly amazing experience especially at 3G speeds! Remember when you used to use those chunky old cathode ray tube computer monitors. That's like existing car DVD systems. Then they came out with those really thin LCD monitors where the picture was brilliant like Albert Einstein? That's the Toyota Camry Emperor! Testing software always changes, so even we can't say in advance what software you'll be getting. It's an evaluation copy anyway so therefore purchasing your own GPS software is encouraged. Do a google search for 3G internet car DVD players. If you happen to find one (good luck), compare its price with The Road Emperor. We're sure you'll see why the Toyota Emperor is a winner hands down.